WHICH BREAKER IS RIGHT FOR MY MACHINE? ENTERPRISING EUROPA is pleased to announce that we have been selected by SOCOMEC.spa of Italy as the importer and general distributor for all Socomecs products in North America. 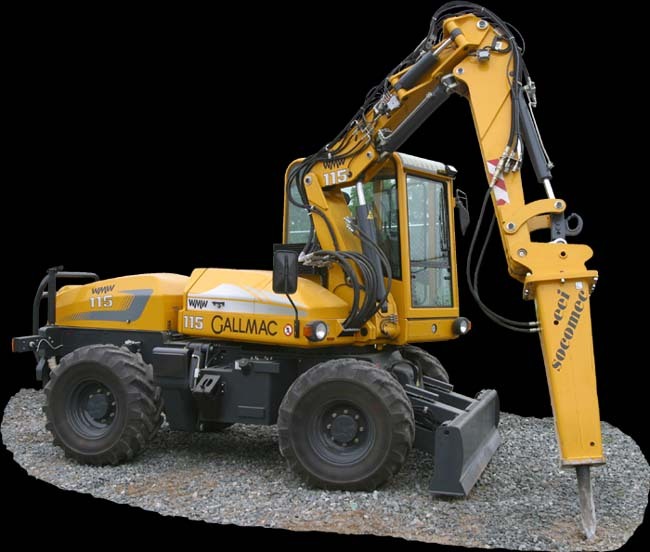 News from ENTERPRISING EUROPA also includes the introduction of Socomec’s new DMS (medium light 135-1630 lbs) range hydraulic breakers and the launch of the new MDO 3200 TS hydraulic breaker which completes the company's medium (2100-7300 lbs) heavy range. New features of the DMS range include a more efficient distributor valve, an improved seal package with enhanced dust wipers and a special valve that stabilizes the working pressure independent of the oil flow. Beside those technical innovations the weights of the new DMS breakers are changed in order to better suit the widest range of excavators on the market and the contractors needs. A valve that regulates the working pressure and keep the strokes constant no matter what the oil flow is. In cases when the oil flow is lower than the one minimum specified, the blow frequency will be lower but the impact will always be kept within 80%. The breakers can be used under water and for under ground mining due to the new seals that also acts as an excellent protection from dust.